This past weekend saw the Cosford Air Show take place in the Midlands, attracting around 55,000 visitors for this annual event. Both historic and state-of-the-art aircraft from the RAF and international military were on display both on the ground and in the air, providing a wonderful showpiece for aircraft enthusiasts and the public at large. These types of air shows and outdoor events always need to hire outdoor furniture and furniture in general for the various areas of their event. Looking at behind the scenes first of all, airshows of this size and magnitude require planning offices, for which items such as reception desks, office desks and office chairs are all required as well as office accessories such as water coolers and dispensers, desk fans and other equipment to ensure that the planning team are comfortable at work. In the public or VIP areas, there is always a large amount of corporate hospitality taking place, with sponsors of the event inviting their clients to enjoy the show. With this in mind, demand for equipment from our extensive range is huge, from hardwood tables and chairs for enjoying a coffee outside, through to mobile bars for the VIP lounges, poseur tables and bar stools to accompany the mobile bars, kitchen cooking equipment hire such as oven hire, microwaves and hot cupboard hire, for instance, all the way through the crockery hire, cutlery hire and glassware hire which is needed to service the dining of large quantities of people. 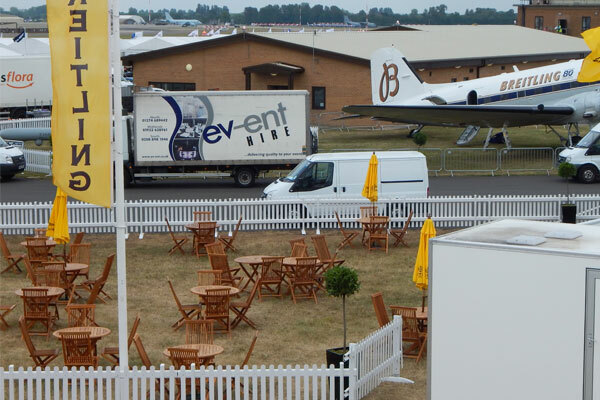 We work with airshow organisers around the country such as the world famous Royal International Air Tattoo (pictured) during the summer season to ensure that they have everything they need in terms of furniture hire and catering equipment hire to cater for all their visitors. These event organisers know that they can choose from our extensive range and the chances are that we will have the required quantities available, being one of the premier event hire companies in the country. Keep your eyes peeled for more news on our activities at other airshows and outdoor events as the summer progresses.